As our friend dropped us off at the Ocean Terminal at Southampton docks, what looked like a large block of flats loomed ahead of us. The Crown Princess, on which we were about to embark on a 4 night “sampler” cruise accommodates over 3000 guests and certainly has the ability to dominate the skyline. We checked in through what felt like an airport departure lounge, but today the normally slick process had been delayed and it was one and a half hours before we eventually boarded. Having spent a night on board the Crown Princesses newer sister the Royal Princess, the layout felt familiar. The heart of the ship is the open Piazza with bar and coffee areas around the dance floor where musicians were playing. We checked into our stateroom on the Aloha Deck 12, which was pleasantly furnished in shades of beige and soft green, with a spacious wardrobe area and plenty of storage. Barely had we got through the door, when Jerry, our Cabin Steward was welcoming us on board and checking that we had everything we needed. Soon after 4pm, we felt the engines starting and we were able to sit on the balcony of our room and watch the port and shoreline of Southampton drift by in the September sunshine. Venturing out to explore the rest of the ship, it felt like everyone had the same idea and there was barely any free seating around the Piazza. Instead we headed up a few decks to grab a snack and cup of tea in the self-service Horizon Court, with large floor to ceiling windows to catch the view. A little further along on the upper deck were the two pool areas, with a few brave souls soaking in the hot tubs on deck and the big movie screen flickering. Oh for the warmth of a Caribbean evening when we could sit out and watch the Movie under the stars! For dinner we had decided on the Anytime Dining option, which meant that we could turn up in the Michelangelo restaurant at any time and be seated at different tables each evening. Feeling sociable, we asked to be seated at a mixed table and had a pleasant evening chatting to two other couples, who were all avid cruisers, so we picked up some tips on getting the best cruise deals. The conversation covered the excursions we had planned for the next day, the fun of dressing up for the formal night, and the different cruise destinations they visited, including the classic transatlantic crossing on the Queen Mary from New York. We could have watched the 10.30 evening show with comedy and musical performances but instead decided to get an early night, ready for our day exploring Rotterdam where we arrive tomorrow morning. Our first impressions are of a big and busy ship, with a friendly, lively crew and plenty to keep everyone entertained. 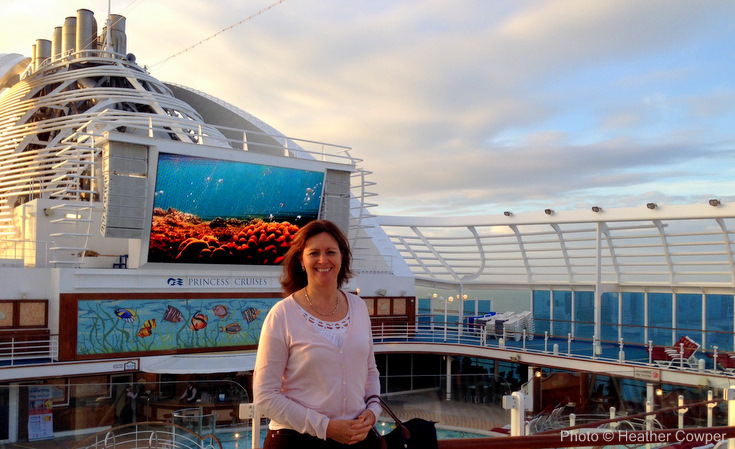 Heather’s 4 night European Sampler Cruise was hosted by Princess Cruises who offer cruises to European and Worldwide cruises to allow you to explore fascinating destinations and escape completely on board their elegant and spacious ships.